Most homeowners put a lot of emphasis on the kitchen, living room and bedroom and forget to add some love to the bathroom only to find out that they have to pay a lot of money to get it updated with the rest of the house. If you are thinking of constructing a new home, do not forget to integrate the latest modern bathroom trends to keep your home slick and stylish all throughout. What could be more stylish than a bathroom inspired from the old world? Take inspiration from ancient Portuguese, Moroccan and Spanish designs to transform a drab area into something that is a feast for the eyes. 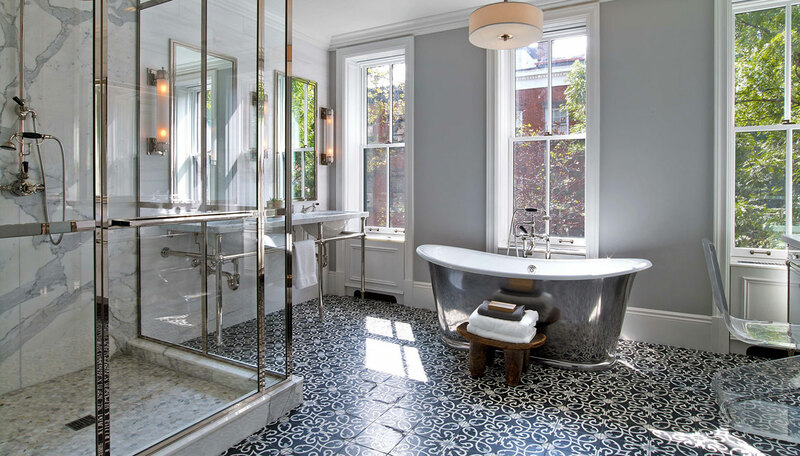 Talk to your new home builder about adding hand-painted terracotta with modern metallic, utilizing mosaic tiles as the accent for your shower or tub. You can also mix timeless arabesque designs with 70s retro shades. Select neutral tiles to achieve that classic Tuscan beauty or go for colorful tiles to give your bathroom that modern Mediterranean sparkle. Your custom home builder may also suggest brass accents for your bathroom. Brass fixtures when paired with marble and metal are absolutely stunning. You may want to consider finishing white or gray bathroom fixtures with brass accents and then place a splash of color in the room. A couple of coats of brass spray paint can easily update any existing bathroom. Want to make your bathroom less sterile? Add some plants to bring some of the outdoors inside. This will make you feel like you are taking a bath in some beautiful island getaway. Plants are also quite good at keeping the air clean by pumping out fresh oxygen while filtering pollutants to ensure a good balance of humidity in the bath. Some good plants to consider are aloe, snake plants, bamboo, orchids and spider plants. To create the perfect bathroom design, a good layout is key. A few deliberate lines and curves make the bathroom less sterile looking as opposed to the standard rigid line approach. Go for a mixture of modern and classic and warm and minimalistic to create the truly perfect bathroom.